What's the SECRET behind Great Hair? Beautiful Hair happens when you connect with that Special Stylist. Especially if your stylist uses great products such as GOLDWELL HAIRCOLOR. Why do we use GOLDWELL Haircolor? . . . Quite Simply, It's "STATE OF THE ART!" - the GOLD STANDARD in our Industry. It's very gentle on both hair and scalp. Our clients rave about the results, and find the shine and condition of the hair simply amazing! ( "click on" TESTIMONIAL LINK in left hand column). 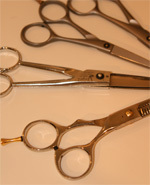 Our Focus: At PAUL WEST HAIRCUTTING COMPANY, it's all about Top Quality Performance . 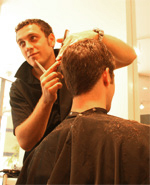 We're proud of our Team of "Seasoned Hair Designers"! 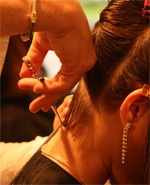 The Pro's at PAUL WEST have extensive "Experience and Knowledge" in both Haircolor and the GOLDWELL Brand. If you want to be the best, you absolutely must use the best, and Premier GOLDWELL Haircolor meets our demanding standards. Think of this as "Liquid Gold. PAUL WEST HAIRCUTTING COMPANY is proud to use GOLDWELL "TOPCHIC" and GOLDWELL "COLORANCE" Haircolor. And, we absolutely love the great results we get from Goldwell's luxurious line of Shampoos & Conditioners. Known for their revolutionary development of both "Low-Ammonia"and "Ammonia Free" Haircoloring products, Goldwell is an innovative European Company that develops and produces Premium products according to the professional standards of discriminating hairdressers. Aquage haircare and styling innovations are formulated combining the highest quality / professional grade ingredients, using today's most advanced haircare technology. The healing benefits of sea botanicals in each Aquage product nurture, hydrate, strengthen and protect your hair...beautifully. Discover the best of sea and science. For the ultimate beauty experience, make an appointment with Aquage.